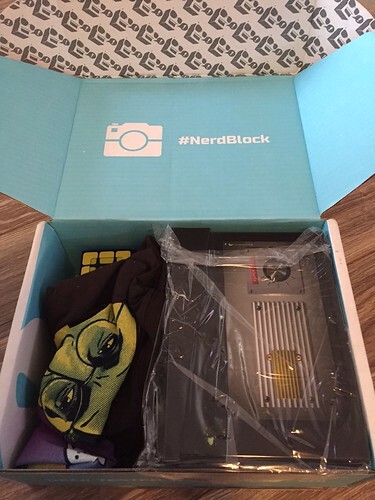 Nerd Block Classic “contains licensed merchandise, hand-picked by our team of uber-nerds representing all genres from movies, television, video games, internet, and more!” The price is $19.99 plus shipping per month. 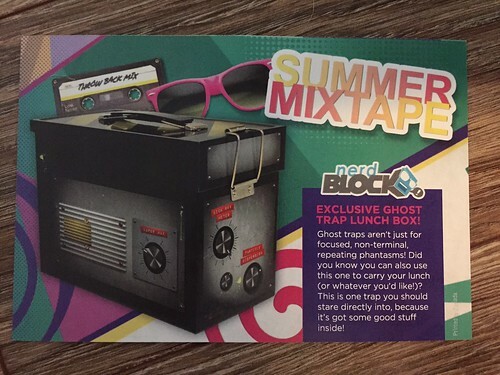 The theme of this box was Summer Mix Tape. 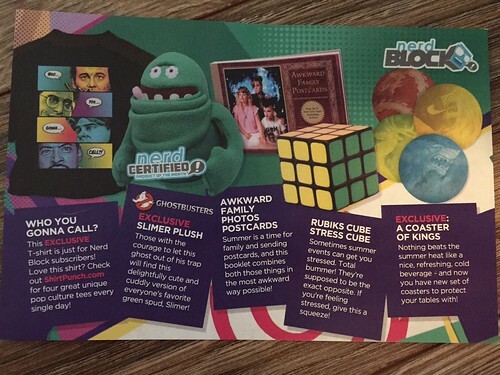 The box comes with a nice card that give an overview of the items in the box. 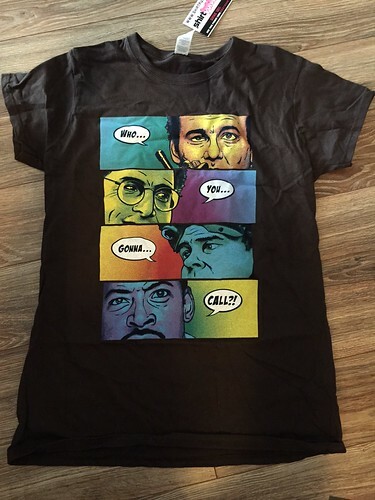 Exclusive Ghostbusters T-shirt (Retail $10-20?) – I LOVE this shirt. The made the whole box for me. 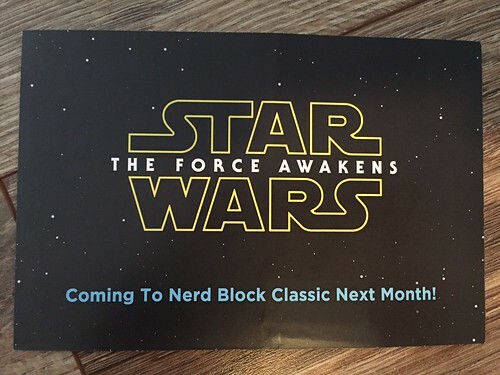 The artwork is fantastic, and I really dig the comic-book feel. Ladies, the shirts are very fitted. So order a size or two larger than normal. Ghostbusters Lunch Box (Retail $10-15?) – This ghost trap look is really clever, and opening it to find this Slimer was really fun. 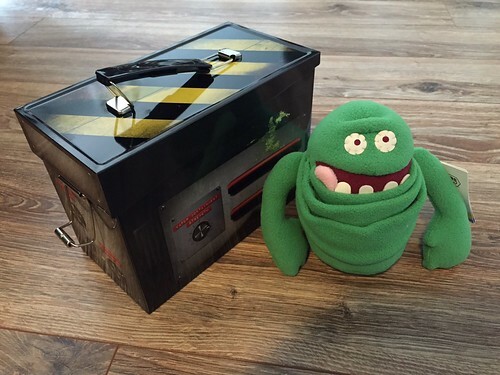 Ghostbusters Stuffed Slimer (Retail $10-15?) – This exclusive Slimer plush looks more like a character from a musical kids show that haunts me. And unfortunately, it doesn’t stand on its own. But I do love Slimer, so Lois Lane may get another stuffed chew toy. Awkward Family Postcards (Retail $9.95) – Yes, I’ve seen most of these from the popular website. But they’re hysterical. I’ll be sharing these with friends. Rubik’s Cube Stress Ball (Retail $5-10?) – This inspired little item is already sitting on my desk at work. 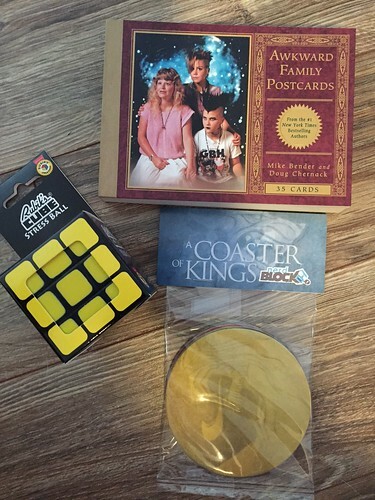 A Coaster of Kings (Retail $1-2?) – These are cardboard, dragon art coasters that fantasy fans will appreciate. I have too many coasters as it is, so I’ll be passing these along to someone else. Summary: This was a fantastic first box for me! I’ll definitely be continuing with this subscription. The shirt and uniqueness of the curated items were a big hit. 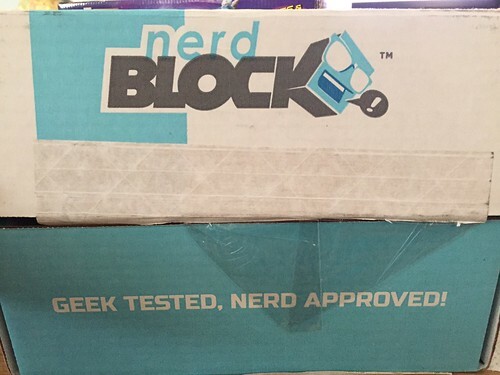 The value is hard to determine on most items, since most were exclusive items to Nerd Block. But the value definitely exceeded the box. Finally, I’m super excited for the next box! Don’t miss this one!